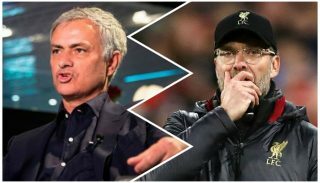 José Mourinho insists that managers should focus on winning trophies instead of implementing a new style of football, which could be interpreted as a criticism of the likes of Jurgen Klopp and Mauricio Pochettino. The pair are renowned for playing good football and getting the best out, but they are all yet win any silverware as Premier League managers. Mourinho argues his corner in this debate often, especially when his pragmatic style of football comes under scrutiny. Mourinho has enjoyed plenty of success in England so he’s in a position to talk, though it gives the impression that he can only use the history in is defence, which is also very sad. Speaking to beIN Sports, Mourinho took a dig at some managers and their so-called philosophies, and that winning will always be the most important thing in football. He said: “I have won titles with every club I have been in, I cannot run away from my mentality. “Some coaches prefer to sell the idea of having a philosophy, but I think, the philosophy, you have to sell it after you win. First, you win, then you sell the philosophy and then you prove to everybody that your philosophy is correct, your philosophy is great, but you have to win. Whatever you think of Mourinho after his spell at United, his trophy cabinet is one of the most impressive around. The Reds won the Europa League under his management but elsewhere he won domestic titles in every country he’s worked in and the Champions League twice — first with FC Porto, then Inter Milan. If you question Klopp for the lack of trophies won as Liverpool boss, you will be bombarded with replies from Scousers on social media fighting his corner. They won’t directly reply to the fact he’s won nothing, which probably means they deal with it more privately as if he’s the Messiah. Of course, Liverpool are still in the title race with Manchester City and Klopp could finish the season with a Premier League title added to his success in Germany. That said, the former Borussia Dortmund boss would still have some way to go to catch up with Mourinho.